Apparently hacking around with my microscope has turned into something of an obsession. 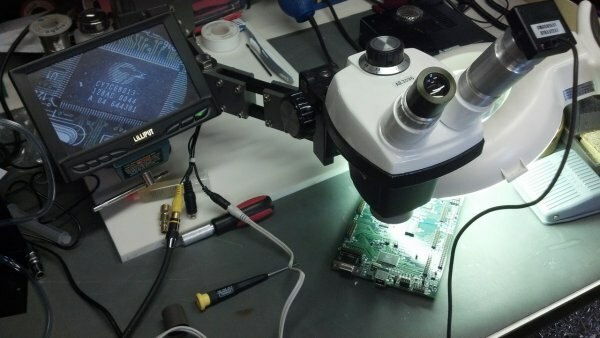 The other day, I wondered if I could easily add a camera output to my microscope. I had a tiny composite video security camera lying around in my parts bin, and somewhat by accident also had a collection of C-mount lenses that fit the camera left over from a lens swap project on an IP camera. I’m not much of an optics guy, but I had a hunch that with the right lens, I’d be able to get a focused image on the camera through one of the microscope eye pieces. It turns out with one of the lenses in the kit (12mm or 16mm, and I’m not sure which due to poor labeling), it works great. After some work with my lathe turning large chunks of aluminum into smaller chunks of aluminum, I ended up creating an adapter with a simple focus mechanism which allowed precisely mounting the camera onto one of the eyepieces. The end result is low resolution, vignetted video output of what is under the microscope. The composite video output can be run to a monitor for live display, or into a capture device on a PC for recording or use with measurement software. Here’s a video I put together describing the project.